WTI crude prices remain in the $44.00/b-$44.25/b range this morning. 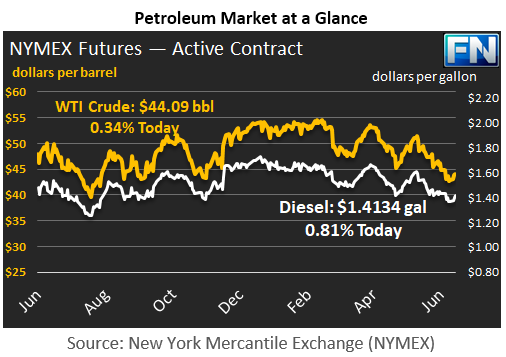 WTI prices climbed as high as $44.44/b yesterday, before subsiding to a close of $44.24/b. WTI opened at $43.70/b today, an increase of $0.21, or 0.48%, above yesterday’s opening price. Prices are $44.09/b currently, down by $0.15 from yesterday’s closing price. Diesel opened at $1.4035/gallon this morning. This was an increase of 2.02 cents (1.46%) above yesterday’s opening price. 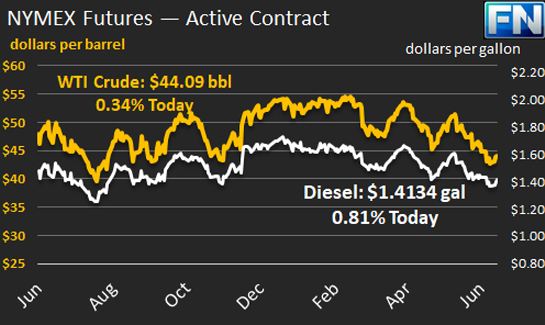 Current prices are $1.4134/gallon, down slightly by 0.03 cents from yesterday’s closing price. Gasoline opened at $1.4466/gallon today, a slight decrease of 0.04 cents, or 0.03%, from yesterday’s opening. Prices are $1.4510/gallon currently, down by 0.88 cents from yesterday’s close. Yesterday brought a sustained price rally, attributed mainly to short covering. Oil prices also received support from weather conditions and a weak U.S. Dollar. The Euro has risen to its highest level against the Dollar in a year. Prices rose significantly in response to an industry survey anticipating a 3.3-mmbbl drawdown in U.S. crude stocks, a 0.7-mmbbl drawdown in gasoline stocks, and unchanged distillate stocks. Later in the day, however, sources cited the American Petroleum Institute (API) weekly data release predicting a crude stock build of 0.851 mmbbls, a gasoline stock build of 1.4 mmbbls, and a distillate stock build of 0.678 mmbbls. This ended the price rally, though WTI prices thus far have remained above $44/b. The market will be keen to see the official statistics scheduled for release by the Energy Information Administration (EIA) later today. U.S. oil inventories have been trending down this quarter, but interruptions to this trend have caused immediate price responses. Our second article today discusses stocks in the larger Organization for Economic Co-operation and Development (OECD). During the January-April period, refined product inventories have fallen. However, crude stocks have risen, despite the OPEC-NOPEC production cuts. This trend points to the need for patience in awaiting the greater impact of the OPEC-NOPEC production cuts.